Reneta L. Green-Streett joins us in our Dover Office and brings over seven years of experience litigating on the other side of the “v” defending insurance companies and insureds. Reneta is an active member of the Delaware State Bar Association, serving on its Executive Committee; is the immediate Past President of the Kent County Bar Association; and volunteers her legal services with the Office of the Child advocate as an attorney guardian ad litem for dependent and neglected children. Reneta is very much a “local.” She was born in Seaford, and grew up on her grandfather’s Greenwood dairy farm. Upon graduation from Milford High School, Reneta attended The College of William and Mary where she majored in English and Sociology and minored in Black Studies. After working for Delaware attorney, Patrick Scanlon, Esquire for three years in Milford after college, Reneta returned to The Marshall-Wythe School of Law at The College of William and Mary for her law degree. Upon graduation from law school, Reneta was pleased to accept a judicial clerkship with The Honorable Robert B. Young of the Superior Court of the State of Delaware, Kent County. After her year at the Court, Reneta took a job with Judge Young’s former firm, Young and McNelis, now operated by his son, Jeff Young, Esquire, and his partner, Brian McNelis, Esquire. Reneta remained at Young and McNelis until she joined Morris James. Reneta lives in Dover with her husband, Branden, who has served in the United States Air Force for the last seventeen years. They share their home with Reneta’s mother and three dogs: Delilah (a black Pomeranian), Dixon (a fawn Pug), and Darbi (a black Pug). In addition to spending time with her family, Reneta enjoys spinning and kickboxing. She also collects elephants with their trunks up in homage to her sorority, Delta Sigma Theta Sorority Incorporated. Reneta is extremely excited to join the experienced group of lawyers that comprise the Morris James Personal Injury Group. She looks forward to representing individuals who need help navigating the scary and complex legal web that is Delaware personal injury and workers’ compensation law. You can reach Reneta at 302-678-4380 or RGreen-Streett@morrisjames.com for all your personal injury and workers’ compensation needs. Lisa Leidy began her career in mental health services as a Youth Rehabilitative Counselor with Kent County’s office of Juvenile Probation. She later provided direct service care to Delaware’s high risk adolescent population conducting community based, intensive outpatient substance abuse treatment in both New Castle and Kent Counties. Lisa has been mentored and worked with some of the most reputable mental health and substance abuse professionals in the state. In 2009 she co-founded Mind and Body Consortium, LLC. Mind and Body Consortium is a multi-disciplinary outpatient clinic that provides mental health services in three locations in Delaware. In 2015, she collaborated with a production company to create a training video for professionals that treat child sexual abuse victims. From her work on this project she was hired as an executive co-producer of “Jason’s Letter”, starring Vivica Fox, Quinton Aaron, and many others, Ms. Leidy’s role on such projects is to recreate the authenticity of real life trauma onto the big screen. In 2016, Lisa and new business partner, Kristin Stonesifer, launched a podcast titled “The Couch with Kristin & Lisa”. The podcast is a light hearted way of dealing with emotional woes. The ladies tackle topics such as “Why Traditional Marriage Counseling Doesn’t Work” to how to deal with “Toxic Relationships”. Kristin & Lisa can be booked for speaking engagements and offer corporate trainings as well. Although it would seem that her plate is already full, in the first quarter of 2017, Lisa signed on as the Director of Delaware Institute of Behavioral Sciences (DIBs). Her experience in direct services, administration and management of mental health and substance abuse programming made her a prime candidate for this role. “I’m very excited to have been chosen to help lead this new team of professionals. DIBs has a strong foundation to become a leader in Behavioral Health services here in Delaware”. Lisa, along with two prominent Wilmington Psychiatrists, will lead the Executive committee for DIBs. DIBs parent company provides services in various states throughout the USA and is slated to launch overseas. Gigi, short for Georgina, was born on November 12, 1980, in San Antonio Texas. She grew up in the US Airforce, living abroad in England and Germany. Her family was stationed in Delaware as a teenager, but she graduated from Southwest Texas High School in 1998, in her hometown of Atascosa, Texas while living with her grandparents George and Eulalia Flores. She moved back to Delaware to attend Delaware Tech, majoring in Criminal Justice. Gigi entered the sales world at NCO financial, later opening her own commercial collection agency in 2007. Mother to four amazing children; Timothy, Hannah, Mariana and Kenneth, Gigi also helps run her family business, Boyd’s Custom Remodeling with her husband, Kevin Boyd. Gigi founded Lady Lifters in 2016 after becoming a personal trainer and going through her own transformation. She was inspired to help other women change their lives for the better, weight lifting did that for her and she wanted to create a gym where women of all backgrounds could work together to accomplish their personal goals. With the help of her husband and several close friends she had her grand opening on October 1, 2016 and has since helped transform many women. Gigi is currently competing in strongman competitions, working hard to become the strongest woman in Delaware. “My goal is to have my business become a franchise in the coming years and bring Lady Lifters to communities around the world.” For more information about her training programs please visit the lady lifters facebook page, see the article in this magazine or visit us at www.ladyliftersgym.com. Contact Gigi direct at 302.222.2321 or gigi@ladyliftersgym.com. A dynamic, inspirational speaker, successful entrepreneur and visionary, Donna Duffy is passionate about helping others, especially women leaders and entrepreneurs realize their greatest areas of impact and influence, with a focus on leadership and potential development. A successful community leader and educator in the Middle East for 18 years, once back in the U.S., she worked in the education field for several years before becoming an entrepreneur by starting an event planning business and shortly thereafter, a tutoring company. Working alongside other small businesses, it became clear that many business owners felt isolated, ill-equipped and on their own. As an innovative leader, she started connecting small business owners, weekly around her kitchen table, to discuss business development, marketing strategies and joint venture opportunities. In 2009, 3E Marketing Solutions, a boutique marketing agency, began officially serving the small business community in the Delaware area. For the past 4 years she has offered a complimentary monthly Boost Your Business workshops (to the small business community) to the small business community, sharing marketing and business expertise and tips along with excellent networking opportunities. As a business and community leader, entrepreneur, strategist and coach, Donna has found that her true passion is helping individuals to identify and embrace their strengths, talents and potential. She strives to motivate, enlighten and challenge others to push past limiting beliefs and mindset issues to transition toward empowered choices and bold forward actions. Donna continually strives to inspire and motivate those who desire to turn their passion into a business, strategically improve their business and/or strengthen and up level their leadership skills. Weaving together her expertise, vision, and humor with refreshing transparency, she easily engages and aligns with her audience and clients, connecting to where they are while creating a vision for where they can go, then provides practical, applicable solutions to make it happen. Donna has become a trusted leader and resource for the business community. Donna’s grassroots methodology, effective communication and willingness to come alongside wherever you are, truly helps others define their need, identify goals and assists in breaking through barriers to overcome challenges and create new opportunities and successes. 2016 John Maxwell Top 30 Leadership Award • 2016 TEDx Women Wilmington Speaker • Author of, Embracing Autumn, A Motivational Field Guide for Mid-life Women Entrepreneurs •2015 Business Woman of the Year – New Castle County Chamber of Commerce, DE• President National Association of Women Business Owners, Delaware Chapter 2014-2016. Chantal Foor has been managing Brick Works since almost the beginning. She was hired as the Assistant Manager when the restaurant first opened in June of 2016, but her work ethic and organizational skills quickly caught the eye of owners Eric Williams, Kevin Reading, and Ryan Maloney. Foor was promoted to the role of manager in October of that year. In the year that Foor has managed Brick Works, she has helped to establish the brewpub as one of Kent County’s premier dining destinations. Training her staff to put service and quality above all else, Chantal has made ample use of her degree in Hospitality Management from Delaware Technical Institute and previous work experience at Abbott’s Grill in Milford. Foor leads a management team consisting of Jacob Ringold, Executive Chef, Justin Colatrella, Head Brewer, Drew Cantoni, Assistant Manager, and Curtis Bailey, Bar Manager. She empowers each member of her team to make their own decisions, and pursue their passions as they relate to the brewpub, ensuring alignment with the vision the owners have articulated for Brick Works. Chantal has brought immense skill as a do-it-yourself-er to the brewpub, building the bar on the restaurant’s patio, decorating for the holidays and beer dinners, and organizing paint nights. Visitors can see her artwork on display with the sign designed for the men’s bathroom. Prior to joining the Brick Works team, Foor served her country as an Airman. In recent months, she has managed the restaurant and balanced an active family life with three children while her husband, an Active Duty Airman, was deployed overseas. Megan is the Co-Founder and Vice President of Mispillion River Brewing in Milford and Founding Partner in Brickworks Brewing & Eats in Smyrna, DE. Born and raised in southern Delaware, Megan learned to brew at a young age- helping her father, an early and avid home brewer, but never expected that she would someday own two breweries. Admittedly, Megan works by day as the director of Population Health at Beebe Healthcare in Lewes, and by night at the breweries. She describes it as an interesting dichotomy, and her passion about both is evident. Mispillion River Brewing is located in Milford, DE and opened in 2013, focused on creating and serving the highest quality craft beer in our area. They brought home a World Beer Cup Silver Medal in 2014 and won bronze at the Great American Beer Festival in 2015 for their Wonka Bar Stout. 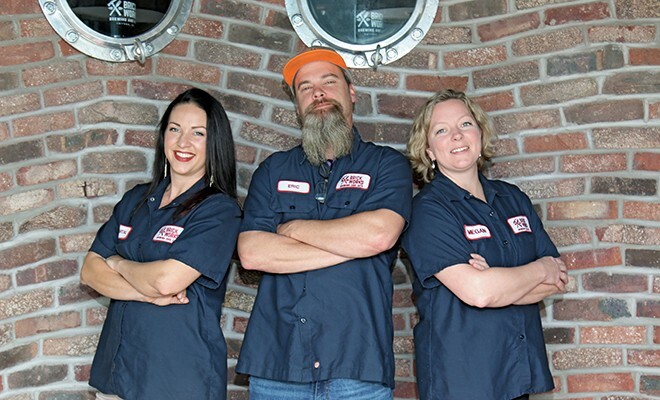 In 2016, Megan and her husband Eric began focusing their attention on the new startup Brew Pub collaboration in Smyrna, with their head brewer, Ryan Maloney, and local chef extraordinaire, Kevin Reading. This collaboration, Brickworks Brewing & Eats, opened in the summer of 2016 and has never looked back- growing momentum each day and so very proud to be a part of the Smyrna community. Megan is married to Eric, also a Delaware native, for nearly 19 years. She and Eric have three beautiful daughters and pride themselves on enjoying each day of this amazing journey that life has provided for them. We would like to thank the owners and management of the Brick Works Brewing and Eats Brew Pub, located at 230 S. DuPont Blvd., Smyrna, DE 19977 for hosting our photoshoot at their fantastic location. You can contact them at 302-508-2523, and you can check out their great menu at http://www.brickworksde.com/food/. We would like to thank the owners and management of the Brick Works Brewing and Eats Brew Pub, located at 230 S. DuPont Blvd., Smyrna, DE for hosting our photoshoot at their fantastic location. You can contact them at 302-508-2523, and you can check out their great menu at www.brickworksde.com. I would also like to extend a huge thanks to Mike Baker owner of C.M. Baker Photography for photographing all of our attendees. None of our shoots would be possible without our partnership with Mike. If you are looking for a professional photographer and all around great person to work with call Mike at 302-335-1500 or 302-242-6643. 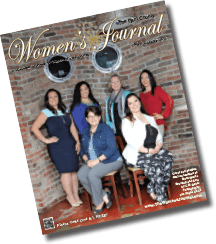 We were honored to have our five professional participants as part of our photoshoot, and I hope that you will let them know you read their profiles in the Women’s Journal. Complete profiles on each of our participants can be found on Pages 26-28.